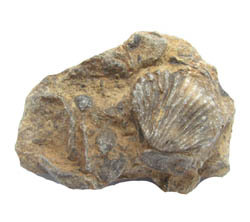 Historically brachiopods have been divided into two classes: Articulata and Inarticulata. This is in reference to how the two shells are joined. In the Articulata a hinge joins the shells together with teeth that fit into sockets. The Inarticulata have a complex of muscles to hold the shells together. Pictured at right is an inarticulate brachiopod. More recently there is argument over whether this is the best system with which to classify brachiopods. Consensus has yet to be reached and these classes are still commonly seen in reference works. Together they account for about 300 species. However, they are seldom seen. The living members of these orders make their homes in very cold waters either near the poles or in very deep ocean waters. •	The Lingulata is the oldest order with their beginnings in the Cambrian Period. The Lingulata has changed little or not at all during the past 550 million years. 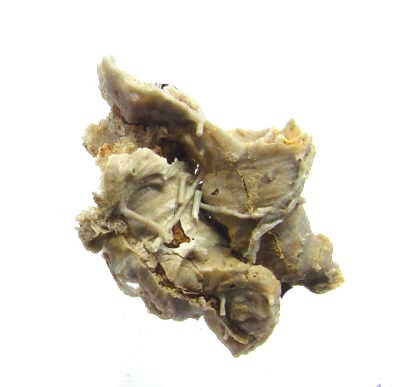 It has a very long pedicle which it uses for burrowing into the sediments of the ocean floor. Normally just the edges of the shell are clear of the sand. The name comes from the Latin word for tongue because of the shape of the shell. •	The order Rhynchonellida first show in the fossil record during the Ordovician Period. During the Mesozoic Era They were the most plentiful of the phylum. Today there are just a few species surviving. At left is a Rhynchonellida brachiopod. •	The Terebratulida don’t make their first appearance until the Carboniferous Period. These are the babies of the group a mere 350 million years old. Today this is the most abundant of the brachiopods. •	Oblellida-was present and became extinct during the Cambrian Period. •	Strophomenida-first shows in the fossil record in the early Ordovician Period. This group was the largest of the brachiopods with over 400 genera. They made it through the Great Permian extinction and became extinct at the end of the Triassic. •	Orthida-had its beginnings in the Cambrian Period and was a victim of the Permian extinction. •	Pentamerida-fossils have been found from the late Cambrian to the end of the Devonian Period. •	Spiriferida-are present in the mid Ordovician, were most diverse during the Devonian Period, and died out in the early Jurassic Period. This order is easy to recognize by the very long hinge line. This is usually the widest part of the shell. The mid-line of the valve has a depression running along it (sulcus). Find out more about the brachiopod.